Mr. Ganapathi H D (Age 42 years) is the only bread earner of his family. 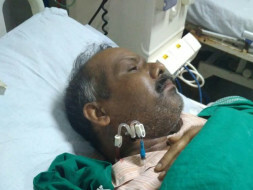 He is currently suffering from Chronic kidney disease of Stage 5, C3 glomerulus nephritis which resulted in the failure of his bout of the Kidney and is admitted in Kasturba Hospital, Manipal and fighting for his life. Doctor says his condition is very critical and require an urgent kidney transplant operation to save his life. Mr. Ganapathi is the father of two small children and is surviving on limited income along with his wife and old parents. 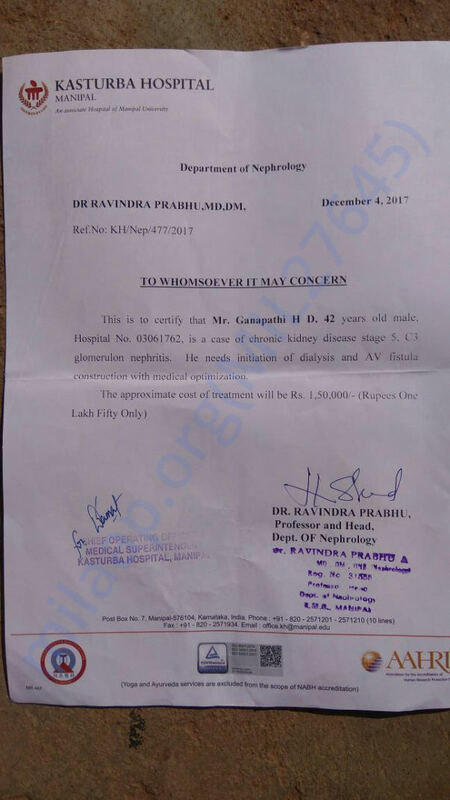 For saving his life, doctors have suggested a temporary treatment of Hemodylasis , medicines and AV fistula surgery on urgent basis to buy some time for his final kidney transplant from future donor and for that total expenses of Rs 1,50,000/- required on immediate basis. Ganapathi ‘s family is so poor that they are struggling hard to arrange this fund, but could not succeed yet even after selling some piece of land and their belongings. This has put the entire family along with the patient at the mercy of the fate and fighting for his life. This campaign is human attempt to save his life by arranging fund for his treatment through crowd funding. Please help him to save not only his life but also save lives of his poor family from shattering. An emotional appeal to all to help him with your kind donation on time and participate in this campaign by spreading this to your family members and friends. To save a human life is the what we are all living for. Certificate from Kasturba Hospital, Manipal.Attached for your ready reference supporting his genuine case of urgency. Please help us to spread the message to all.